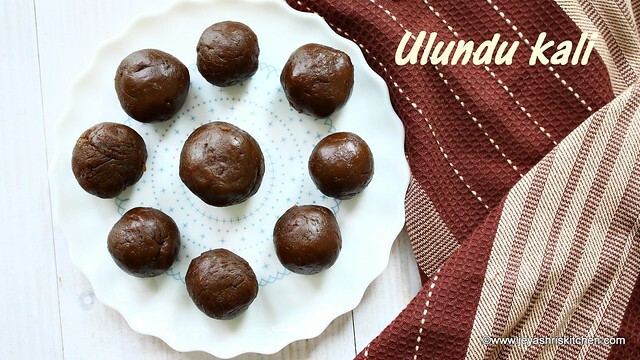 Ulundu kali recipe, Ulundu kali in Tamil,video and step by step pictures, it is a traditional dish made using rice, black urad dal and karupatti. It is an authentic Tirunelveli style recipe, made for breakfast and this is very high in protein too. Generally it is given for newly delivered mothers and girls who attained puberty, as it it strengthens the hip bones. I have heard about a lot from my friends and during my childhood days my neighbour autny makes it and send for us. My sister eats that but i never used to touch that. Very recently one of my friend share with me Ulundu kali sometime back and some how liked it too. 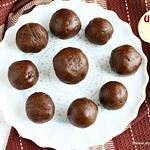 I already have request from my friends to post this ulundu kali recipe in Jeyashri's kitchen. She clearly explained the recipe as her mom and mil are expert in making this kali. She shared with me the flour too, which she got from India. I am delighted to share this healthy recipe with you all today. Do try this at home and let me know how it turned out. Description: Ulundu kali recipe, Ulundu kali in Tamil,video and step by step pictures, it is a traditional dish made using rice, black urad dal and karupatti. *For 3 portion of raw rice 1 portion of black split urad dal - Clean with a dry cloth and powder them nicely in a mixie or in rice mill. Ensure it is finely ground. You can use whole urad dal too. In a heavy bottomed vessel add the karupatti and add the water. Once the palm jaggery melts, filter the impurities. Add back the water to the pan, and let this boil nicely. Simmer the flame to the lowest. Sprinkle the flour on the top of the water. Add 2 tsp of oil to this. Cover this and keep it undisturbed for 15 minutes. Ensure it is kept on a lowest flame possible. After 15 minutes, open the pan and mix it well using a ladle or you can use the back of the ladle. Mix it well without any lumps. Cook in a low flame till it comes to a whole mass and becomes shiny. Add rest of the sesame oil in between. I added few drops of ghee too. Wet your hands in water and touch the kali in the pan. If it doesn't stick in your hands then it is done. Once it is hot enough to handle, grease your hands with sesame oil or ghee and make lemon sized balls. Ulundu kali is ready to serve now. Always sprinkle the flour and cover it and keep in low flame. If you start mixing it immediately it will form lumps and then it is difficult to break them. 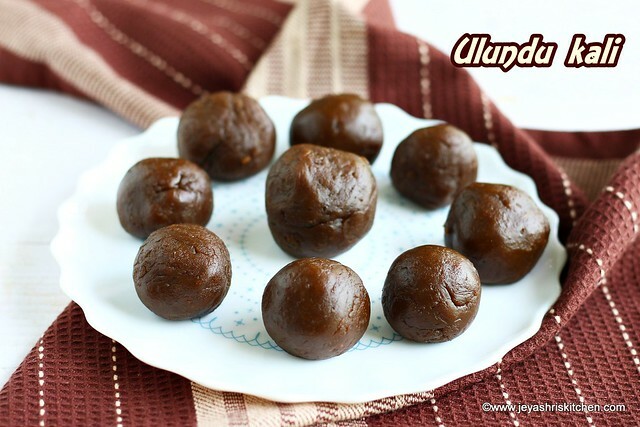 Ulundu kali tastes best withe karupatti, but if you don't get use jaggery. Use Cold pressed sesame oil (chekku ennai) for making ulundu kali. I am very keen to make this recipe and I am still thinking that soon go to the kitchen and start making this method. I so want to make this, my mil was saying about using karupatti in this but didnt give me the ratio. this looks fab! !